Bath remodeling in many ways is much more difficult and more expensive than kitchen remodeling. And the budget is usually smaller. The major cause is the many quite expensive vertical finish materials: mirrors, glass shower doors with glass panels, and tile walls. A second cause is that in order to significantly improve most bathrooms it is often necessary for the plumbing layout to be altered. And since plumbing is by far the most expensive trade employed in any home renovation, costs as a consequence quickly go up. Because of the seemingly high prices for smaller baths many homeowners are tempted to engage one-person contractors who do the electrical, plumbing, tile layingand everything else in the bath. Homeowners should be aware that it is rare for any one person to do ALL of these crafts wellparticularly plumbing or electrical. Using a one person tradesman to do all the work is a high risk proposition. If less than perfect plumbing work is done the cost of corrective measures can be substantial as it may necessitate removing tiled shower floors, tubs or cabinets AFTER all are complete. An exceptionally good plumber is an absolute necessity in remodeling any bath. Being required to redo the work at a later date because of poor work completed is VERY costly. 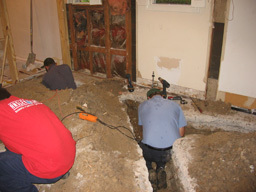 If a new layout is in the cards, bathroom projects generally begin with excavating the foundation for the often massive plumbing changes required, thus adding one more significant step in the front of the process. This front end step is the primary reason that it takes a relatively longer time to finish these bathrooms. Choosing the correct company to deliver the proper level of precision in constructing your bathroom is very important. In making this decision it is important to note that there is sometimes a huge difference between residential general contractors and kitchen and bath remodelers. Residential general contractors do a wide variety of work which usually includes bathroom construction. They often do a great deal of work on the exterior of a home such as siding replacement and concrete work. Residential kitchen and bath remodelers only work on kitchens and baths even though they will occasionally do additional work on your home as an accommodation. And they most definitely do have broad construction skills but they prefer to work on kitchens and baths. The difference between the two is one of precision. To most bath contractors detailed design and exact placement of each element within the always tight space of a bath is very important to them and their tradesmen. To give one example: If you compare a general contractor's framing carpenter with one employed by a kitchen and bath contractor you will see a clear difference. Most tradesmen develop an average level of precision throughout a job through the human force of habit. If they are building an entire structure an acceptable error tolerance in the placement of a 2 x 4 stud of ¼” or even ½” or ¾” may be fine in many instances. But where they are placing a structural member such as a stud in a bath, this level of tolerance may not allow for the symmetrical centering of a bathtub below a window. Because of a particular design element exact placement of the stud may be essential. Those tradesmen who primarily do kitchens and baths on a daily basis will be much more likely to have habits of greater precision as constructing kitchens and baths require it. Residential general contractors are also less precise regarding design because most of them obtain their work through competitive bidding of plans and specifications. Because of this they rarely go further than what the plans and specifications call for. On the other hand, competent and honest kitchen and bath remodelers look upon their business as a personal service and will look daily for opportunities to further refine the design and more precisely construct each element in your kitchen just to please you more. At Woodmark we call these habits of greater precision The Woodmark Way. During each step in the construction of your bath we work hard to retain your home’s existing architecture so as to allow your bath to seem to be an integral part of your original home. We invite you to point out any construction flaw or omission during the construction process in accordance with our belief that every pair of eyes is a resource for quality control. All work is completed using a systematic critical path process. The critical path by way of an example can be illustrated in the way we all prepare Thanksgiving dinner. The total time it takes to bake the turkey represents the critical path in completing the meal: little importance at the outset is attached to how quickly most vegetable dishes are prepared since you will have to wait for the turkey to finish baking anyway. Our method is to always focus on the time taken by individual critical path steps. We work on as many parallel steps at once such that no time need be added to this longest path throughout the project simply because all shorter steps had not been completed earlier. Any existing imperfections such as bowed walls, out of level ceilings, etc. within reason are corrected completely. Our goal is for your entire bath area to look better than when the home was originally built. We will never compromise on the constructed quality of your bath for ANY reason whatsoever, including being asked to complete it in a shorter time. We leave your toilet in place until it must be removed in order to complete the space. Having many years of experience in working in occupied homes we have developed techniques to minimize the effect of construction dust on your daily living. We move load bearing walls easily and install a superior supportive structure for the load above because of our clear understanding of your home’s structure gained from building many homes over many years. Our kitchen and bath tradesmen are trained to always do things the correct way not necessarily the easy way. Only responsible and trustworthy kitchen and bath tradesmen and their helpers with a long history of working with Woodmark in Houston are allowed to work in your occupied home. Your will find that our Houston kitchen and bath tradesman show up when they say they will. You will find that our Houston kitchen and bath managers show up when they say they will. We are sensitive to your daily and weekly schedule in scheduling our work. We are sensitive to the needs of your pets. We will finish your bath in a timely manner. Please call for free advice on how to best remodel your bath for dramatic effect!